Black Friday no longer means getting in line at 3 a.m. to score one of the few insanely discounted flat screen TV’s Best Buy has left in stock. In today’s digital world, consumers aren’t confined to just one day of shopping and certainly don’t have to deal with crowded malls and aggressive shoppers. With Black Friday savings easily accessible during the “pre-Black Friday” time period, on the day itself, and into the following week for Cyber Monday, there’s more marketing messages and promotional clutter than ever for consumers to sort through. The right Black Friday strategy can help brands differentiate in order to attract new customers and meet year-end revenue goals. Here’s a few of our favorites from this year, and takeaways you can implement into your own brand strategy! What’s trendier than doing Black Friday well? Not doing it all. Well, at least for REI, a co-operative selling recreational gear and outdoor experiences. 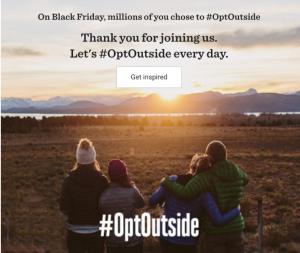 2018 marks the fourth year of their viral #OptOutside campaign, which encourages consumers to skip the mall on Black Friday and get outdoors instead. In addition to closing all stores and giving their 12,000+ employees the paid day off, this year they also pledged one million dollars towards researching the health benefits of spending time outside. While shutting down stores on one of the busiest shopping days of the year may sound bad for your bottom line, REI has actually seen increased profits from this campaign. The takeaway: Be true to your brand. REI’s mission is to “Inspire, educate and outfit for a lifetime of outdoor adventure and stewardship,” and this campaign couldn’t be more aligned with those values. Inspiring not only their customers, but their own staff, to spend Black Friday focusing on something other than material possessions speaks volumes and creates a level of genuine consumer trust that can’t be forced. 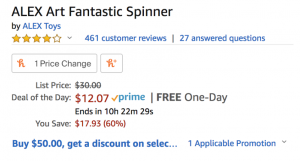 It’s no surprise this e-Commerce giant made our list, but for Amazon, one day of epic deals just wasn’t enough. They turned Black Friday into a week-long celebration, where consumers went up against the clock to capitalize on various daily deals. This strategy essentially makes shopping a competitive game, and no one likes to lose. The added pressure of having to hit “Add to Cart” before time runs out means you may have spent the week obsessively checking for the shiniest new deal. P.S. We hope you got the hottest toy of the season that’s sold out everywhere and #1 on your nephew’s list before the deal ran out. 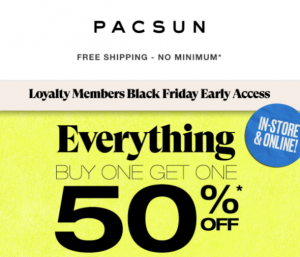 Shoppers dread those early hours and long lines that come along with Black Friday, but Pacsun’s loyalty members didn’t have to deal this year. All you needed was an email address to join their rewards club and unlock access to Black Friday deals the public wouldn’t get for days. Goodbye endless line, hello to that adorable new sweater—minus having to getting in a fist fight over the last one in your size. The takeaway: Customers want to feel like they’re part of an exclusive club, especially when it comes with valuable perks. Using this kind of strategy can make your email list a whole lot longer, meaning you can retarget them with additional promotions later—transforming many one-time buyers into repeat customers. 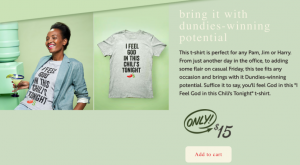 Chili’s has embraced their meme-worthy status by creating a pop-up retail store complete with all the wearable jokes from The Office you never knew you needed. Extremely clever copy and visually appealing imagery, sprinkled with quite a few baby back rib puns, reached consumers on a level deeper than skillet queso. The takeaway: Even if you’re not a retail store, you can still capitalize on Black Friday in a creative way. 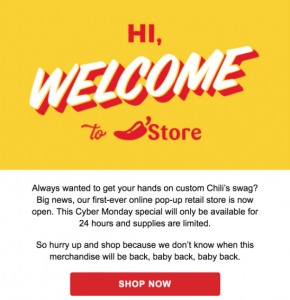 Whether or not tons of consumers are going to actually buy and wear a Chili’s bomber jacket isn’t the point here—this kind of half-joking campaign is likely to go viral on social media and create a lot of buzz for your brand. The card game company Cards Against Humanity is notorious for pulling Black Friday stunts— last year, they claimed they were leaving the gaming business to create a new line of potato chips called “Prongles,” a not-so-subtle knock-off brand poking fun at how potato chip companies essentially sell bags of air. This year, Cards Against Humanity took their shot at this capitalistic holiday by offering a rotating list of extremely bizarre and expensive products for 99% off. 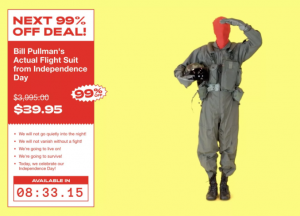 From rare diamonds to this novelty flight suit, consumers loved tuning in to see what the next ridiculous item would be. The takeaway: Over-the-top Black Friday stunts are Cards Against Humanity’s MO, and consumers are always eager to see what they’ve going to do next. We can’t really tell if their yearly gags are meant to be an actual protest against capitalism, simply a joke, or a very strategic publicity stunt, but one thing is for sure—they’re an attention grabber, and sometimes that’s all you need to differentiate in a highly saturated market. After all, did any other card games make the news this weekend? The way companies do Black Friday can influence how consumers feel about their products and overall brand image throughout the entire year. Does your brand need help creating marketing campaigns that will make a long-term impact? Our strategy experts are up to the challenge.